This area is for Foodie TALK, Foodie NEWS, Foodie GOSSIP, Tv Shows related to food. Anything worth Foodie related Coversation. How to Survive the Government Shutdown: What should we eat? First let’s talk about who the FDA is and what they do and review. So now we know who the FDA is and what they do, now let’s talk about what foods they regulate. They regulate bottled water, infant formula, some Meat and Poultry, Dairy and Vegetables. One thing that would be good is eating Kosher food. Due to religion of Judaism, Kosher food would be highly sanitary due to their enforcement of no cross contamination with the separation of meat and dairy. You’ll also want to avoid foods that are processed and does not require cooking. Those are things like deli meats, processed cheese, anything that you can think of along this line you would want to avoid. You should also avoid unpasteurized fruit juices, fresh vegetables and produce. Unless you have your own garden or trust someone who has a garden, I would not suggest purchasing from grocery stores without the proper food inspection. You should be consuming foods that requires cooking, this is to make sure that you are getting rid of bacteria. Please cook all food to correct temperatures, refrigerate properly and avoid cross contamination. Meat is regulated by the USDA and they said they would continue monitoring it for our safety during this shutdown, however still take all precautions. **DISCLAIMER** EVERYTHING MENTIONED IS MY OWN OPINION. FOR FURTHER INFORMATION VISIT THE FDA WEBSITE PROVIDED BELOW!!! I know I’m very late with this post. 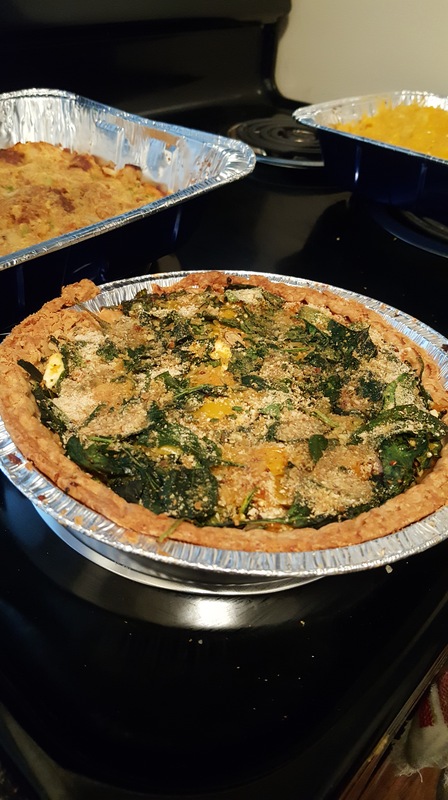 As a matter of fact, Pretty soon we’ll be getting ready for Thanksgiving once again but I wanted to reflect on last year as it was my first vegetarian Thanksgiving. 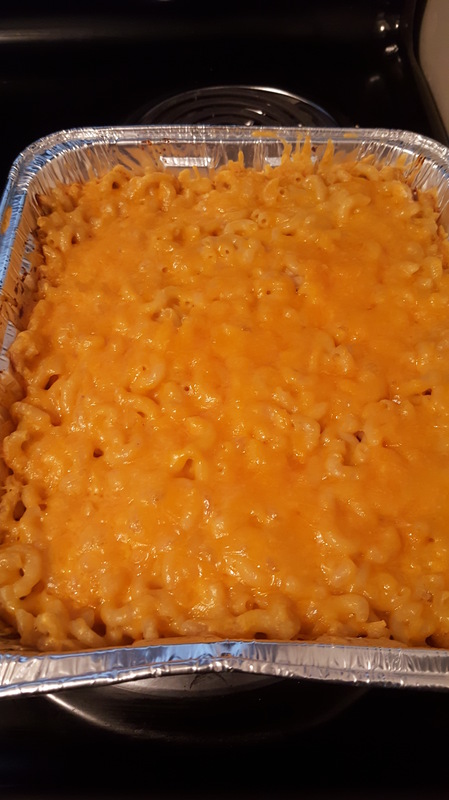 I must admit, the preparation for the day was a struggle because I am used to prepping a turkey and all the other dishes that may include meat. However everything I used even down to the stock was vegetable. 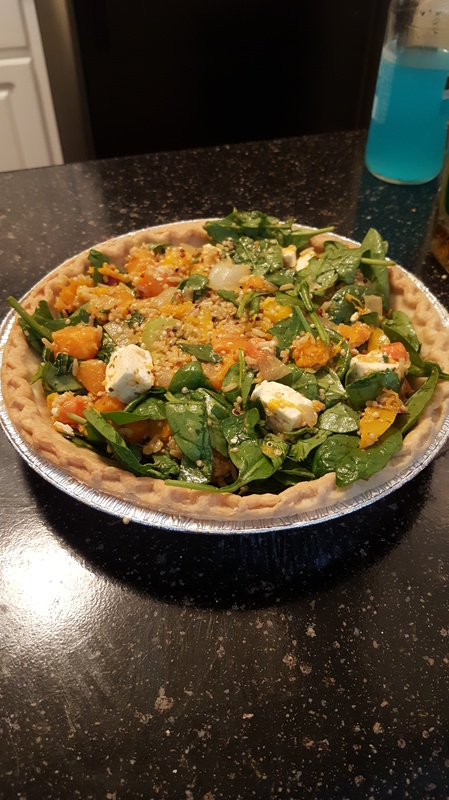 The menu included two veggie tarts, macaroni and cheese, vegetable stuffed stuffing, an appetizer of pear & cheese on crackers and cranberry and almond salad with a simple vinaigrette. When the day came and it was time to sit down for dinner I can say I did not miss the meat! 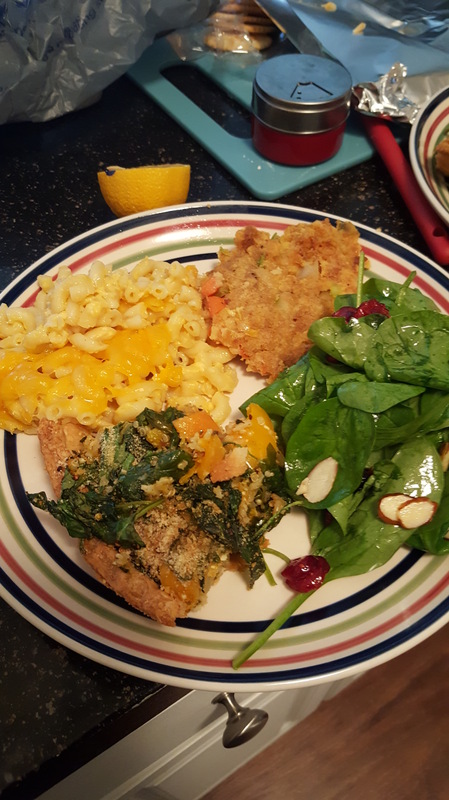 Everything was delicious and filling! I still took my nap and woke up to eat some more. 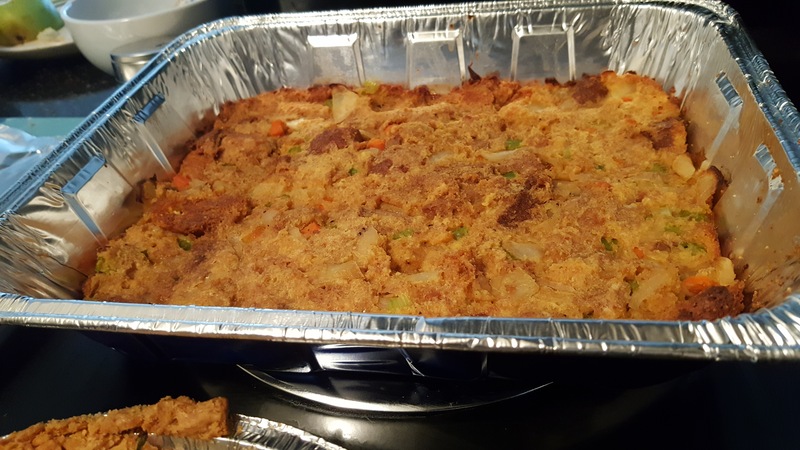 Enjoy these pictures from my vegetarian Thanksgiving! The Vegetable Tart Before and After Cooking! Warning: this is very wordy blog! This post is for READERS and those who actually want to learn something. One subject that is a hot topic in the food community is the matter of GMO. Short for Genetic Modified Organisms, an easy definition of this is basically taking the DNA from one species and adding to another species in order to give that second species a specific trait. This has actually been going on for years in regards to the food we eat. That is why there’s such a fuss behind whether what we eat is naturally grown or scientifically modified. Most modification up until this point has been to enhance the food we already eat. Most of the time making it bigger to give us more. The fear is that GMO has a negative effect on our health. I’m not here to argue against anyone who supports modification of food but to just state my opinion on how GMO can be harmful to humans. Definitely state your opinions in the comments I love to read other points of view. A lot of the GMO testing that has been done claims that the nutritional value is not lost but enhanced through pest resistance, herbicide tolerance, disease resistance, cold tolerance, drought tolerance, nutrition, and pharmaceuticals. Yet some of the biggest side effects of GMO has been disease, growth disorders and mental defects in humans especially in children and fetal development. GMO testing has done nothing but make food bigger and change the color of foods to make them ‘cool’. Recently in 2017 new apples are going to hit the stores and their not going to be labeled GMO but they will be called Golden Apples and these apples are supposed to not brown after cutting which is called oxidation, it’s normal. While this sounds cool, removing the polyphenol -which the substance located in any plant-you cancel out the natural resources like vitamin C, E, etc which humans need to consume to fight against cancers. All this is about profit. Normal apple shelf life doesn’t last long costing money. If apples don’t brown, they have a longer shelf life which means stores can sell us older apples and still make money. I won’t even get into the politics of it. I’ll stick to the health risks..
Other side effects include infertility, immune problems, accelerated aging, faulty insulin regulation, allergens, antibiotic resistance and changes in major organs and the gastrointestinal system. Everything has been modified from cereal, cake mixes, cheese, milk, even veggie burgers. Please do your research people and find out what foods are being modified. Also support your local farmers and grocers. It’s up to us to maintain our health. Please let me know if you don’t support or if you do support GMO foods and why. Most of the food shows on TV are scripted contests/reality shows that keep the masses entertained with mild drama while also watching people jump through hoops for a mediocre prize or a recipe show where the host is cooking the same thing you see on other shows with their own little twist on it. They mostly target the idea of making you hungry so you will buy into their products. There are really no shows out there for the true culinarian with substance that allows you learn and feed more into your passion for food. The Netflix Docu-series “Chef’s Table” is a tribute to amazing chefs from all over the world, from all walks of life and unique personalities and they all have one common passion: The love for food. There are 3 seasons and I am currently watching the third season. For me, I am truly inspired by learning about their lives and how their struggles, family ties, and culture are engrained in the food they cook. Literally their plated dishes tell the stories of who they are, where they came from and the deep rooted love for natural and exotic ingredients. In the first season, the chef who I was the most impressed with is Chef Massimo Bottura. I was most impressed by his delicacy involving tortellini. He made a statement about how people just inhale those without really tasting them, it’s almost an insult to the chef who spent time making the delicate dumpling and filling and preparing them so lovely. He prepared them in away so that the broth is both gelatin and liquid making the tortellini look as if it’s moving on the plate. 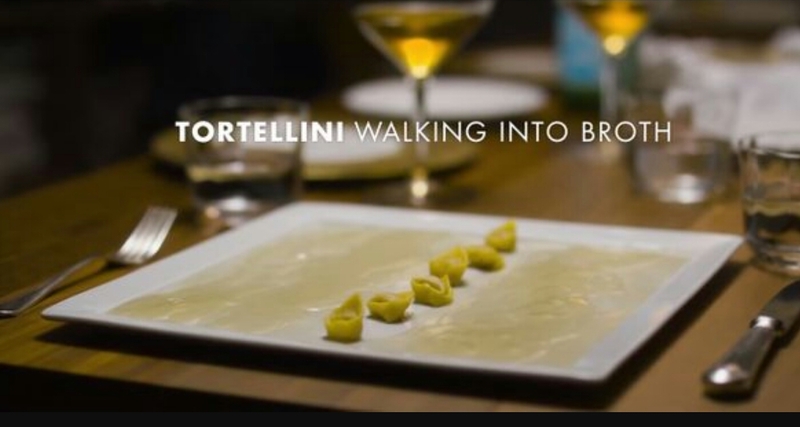 So his dish Tortellini walking into broth is something I’m dying to try and to appreciate. I believe he referenced this dish as “the tortellini walked onto the broth the way Christ walked on water”. Deep. In the third season, while I have not gotten far into the season. I am already impressed with Jeong Kwan. She is actually a monk, living in Korea and her food often called “Temple Food” has recently crossed the ocean and is now known amongst many culinarians in the US. What I appreciated the most about her cooking is the spiritual aspect of her meals and how the ingredients she chooses is closely related to her spiritual journey. Eating no meat or even fish, all of her dishes are of the freshest, most simple ingredients and she doesn’t even use hard spices like garlic or onion, yet everything is delicious says the American commentators in the scene. What stuck out to me the most is her lotus tea. 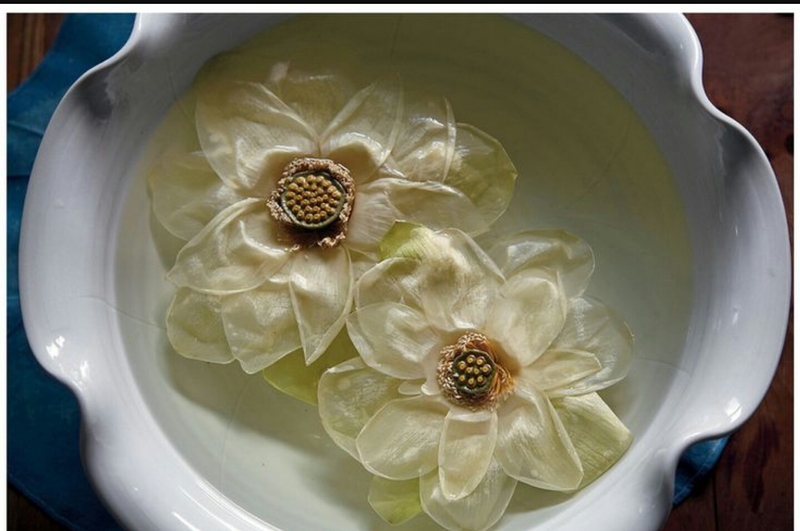 Looks to only be made with two ingredients, the lotus flower and water but it looks so pure! I would love to have a taste! I definitely recommend this series to anyone who likes documentaries, serious food related content, and anyone simply curious enough to just learn something new while being entertained. Get your popcorn and blanket and binge watch this series! You can find all 3 seasons currently on Netflix. Thanksgiving is one of my favorite times of year. I have to admit I got so burned out on eating Thanksgiving food that I actually didn’t celebrate it for a couple of years, being that i am from the south Thanksgiving food isn’t that different from Sunday dinners and family dinners every other night of the year. But after my hiatus and now that I am on a healthier diet I am starting to look forward to Thanksgiving and indulging in my favorite dishes. I am not a big fan of Turkey but I love to cook it. i love the different methods: frying, roasting, brining, stuffing, grilling and smoking. But no matter how juicy the turkey is it still tastes dry to me I think its really the texture of the meat i don’t like so much. Flavor wise I love fresh herbs and citrus, bold flavors and spice. Its help me get through what i think is dry taste. And don’t forget the rolls…YOU HAVE TO HAVE ROLLS! I’m not picky about desserts, the only one I really don’t like is pumpkin pie. But if I had to pick a favorite Thanksgiving dessert I would choose sweet potato pie. I am such a southern girl. Even though I do not like turkey by itself, after thanksgiving is something I look forward to the most because of the Turkey Sandwiches!!! I love a late night turkey sandwich leftovers the next day. yum!!!! What are your favorite Thanksgiving desserts? What are you looking forward to? Quinoa is a major part of the clean eating, vegan, go green, healthy lifestyle and a lot of people are now on the bandwagon of eating it. It is a very versatile grain and can be used in just about every way that can be thought of. Quinoa is a lot healthier than rice and pasta and is very high in protein and is gluten free which is great for the people with that allergy. It contains good carbohydrates that won’t spike blood pressure as well. Quinoa provides essential vitamins such as: iron, B-vitamins, magnesium, phosphorus, potassium, calcium, vitamin E, also minerals and fiber. Also known as a whole grain it also contains amino acids, now these are all the scientific nutritional benefits that we care about but don’t really know what it means. Basically, Quinoa is organically and biologically one of the healthiest foods that be digested. With that being said, proper care must be taken when cooking and eating Quinoa because of the saponins on which is a slight powdery, soapy substance that covers the seeds it must be rinsed every time before cooking and it must be rinsed well because that substance is actually chemically toxic to your body, even still with all its nutritional benefits it is still only recommended to be eaten a few times a week, not something to be consumed daily. Quinoa can be used as a substitute in any dish where rice or pasta would normally be present. It does taste and smell bitter on its own but rinsed before cooking and seasoned very well, Quinoa can be quite delicious! Here are some ideas for Quinoa uses: can be used in veggie burgers, stuffed inside vegetables, added in soups and sauces, it can be a great money stretcher, add it to any already prepared meal to stretch it out for a family and it can be very filling as well. 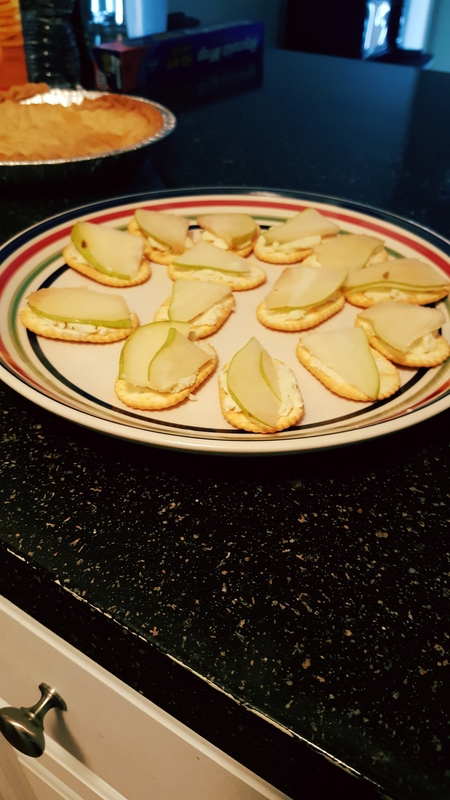 This is the Twisted Lemon’s Fiancee and I am here to make a guest post today.. So I am a diehard root beer lover. I always find myself having the conversation with other root beer lovers of the different types of root beers and the different flavors and taste that each root beer has. To a non-“rootbeerian”, hearing these conversations may be a bit odd or doesn’t make sense. But to a rootbeerian, it makes total sense. I usually start the conversation off by saying, “I love root beer”, then a fellow rootbeerian would respond with “I do too, but not all root beer is the same!” And then the conversation will go into the different types of root beers. 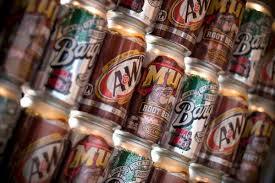 Some of the popular brands of root beer’s that comes up in every rootbeerian conversation that I have are; Mug, A&W, Pub and Barq’s. Now to those that don’t like root beer, they think that all root beers taste the same, but I am here to tell you that not all root beers taste the same!!!!! Yes all root beers have that sweetness component to them, but there is a distinct taste between each. For example, A&W is a bit sweeter than all the others, it’s sweet from the minute it enters your mouth until you swallow it. Mug is not as sweet as A&W, but it has a thicker texture and is very smooth. Both Pub and Barq’s taste similar to me, but Barq’s has more of a root beery flavor than Pub. When it comes to Pub and Barq’s, I like to mix the two together to come up with a different but flavorful root beer concoction. Next time you see a person drinking root beer, ask them if there’s a distinct taste to that root beer and see what they say. Are there any “rootbeerian’s” out there? Am I the only one that feels this way about root beer? What are your thoughts?